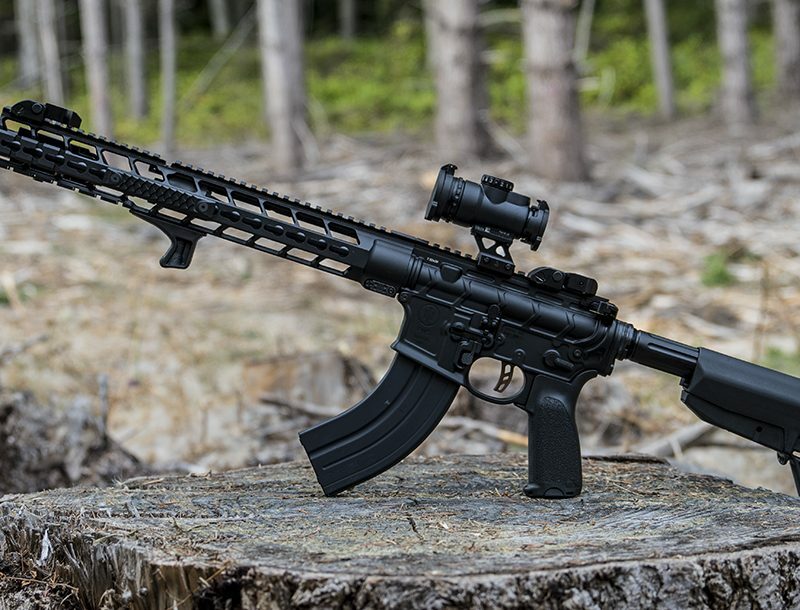 These 20 piston-driven ARs are bred to run cooler and cleaner in harsh extremes! Cleaner. Cooler. More reliable. These are just three advantages cited by people who prefer piston-driven rifles over direct-impingement guns. The Stoner-type direct impingement system traditionally used in the AR-15/M16 platform bleeds off propellant gas from the bore and directs it through a tube to the bolt carrier group, which then cycles the gun. While the direct impingement system can be very reliable, there is no doubt that a lot of fouling can build up on the bolt carrier group. 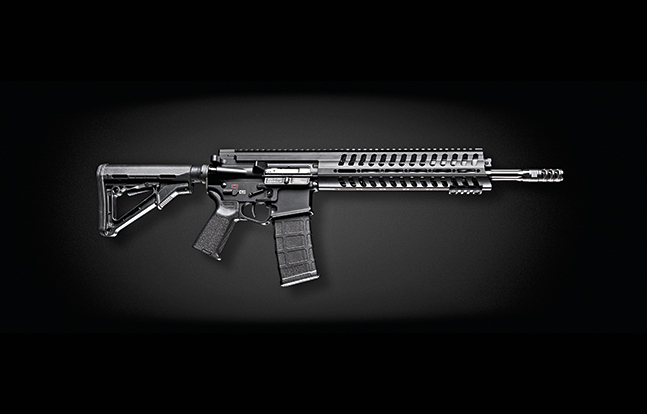 A growing number of companies now build piston-driven AR-style rifles. These guns use the propellant gas to operate a rod that acts as an intermediary to exert force on the bolt carrier group to cycle the weapon. All excess gas is bled out of the gun well forward of the receiver. This helps keep the guns extremely clean when compared to the Stoner-type direct impingement system. 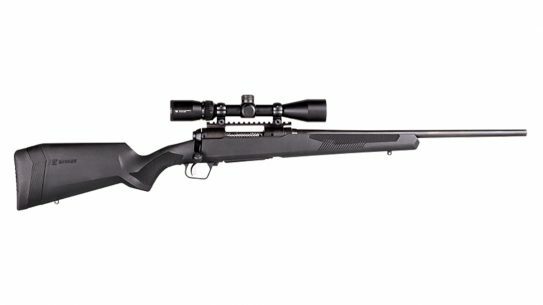 There is a wide range of rifle configurations available with a piston system. Calibers run the gamut, as do barrel length, furniture and intended use. 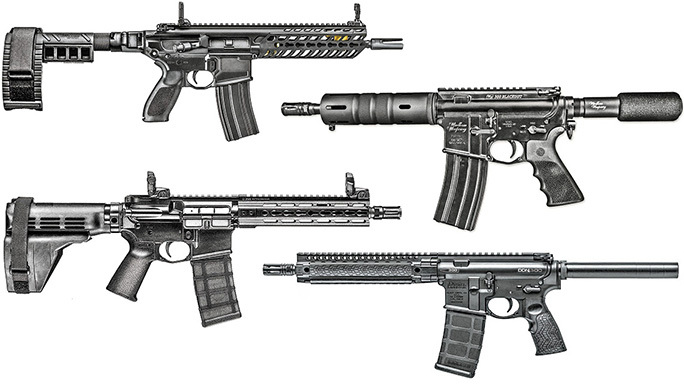 Here are some of the best piston-driven AR-style rifles on the market today. 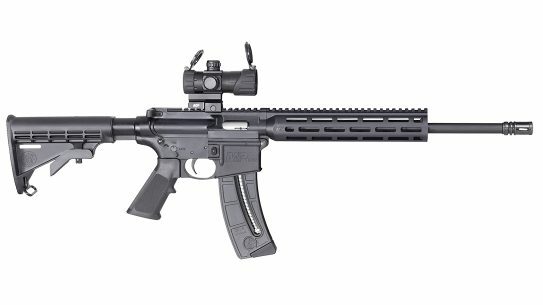 The COR Ultra Lite rifle from Adams Arms features a 16.5-inch barrel with a 1-in-7-inch twist rate and a VDI Jet Comp. It uses a low-mass bolt carrier and comes standard with a Magpul MOE stock and pistol grip. 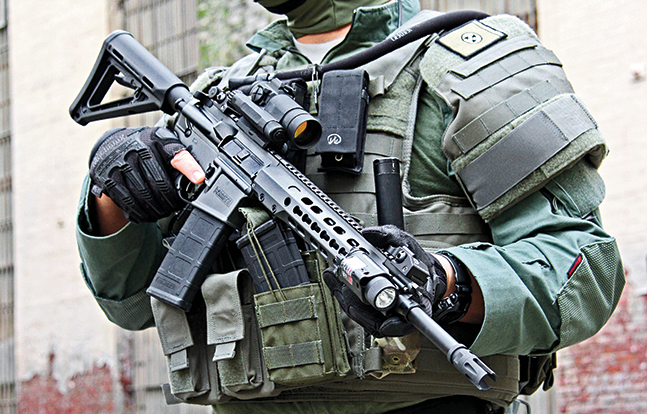 The handguard is a Samson free-floating rail system. Diamondhead D-45 sights are an optional upgrade, as are Kryptek finishes. 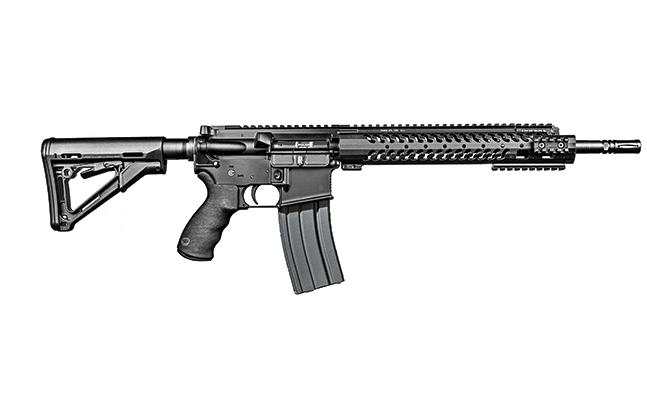 New to the Adams Arms line is the .308 Patrol Series of short-stroke piston rifles. 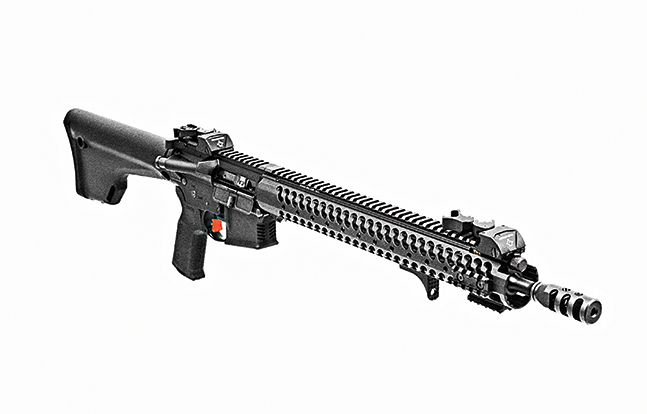 With more than 50 percent of the rifle reciprocal with standard AR-15 parts and accessories, the compact and lightweight heavy hitter gives shooters a powerful and easily upgradable 7.62mm NATO carbine. 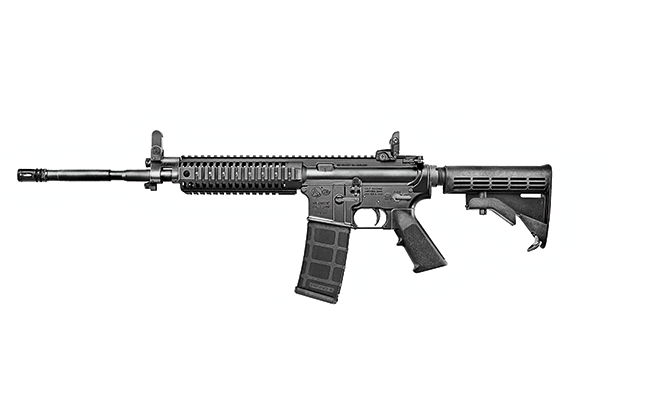 An Enhanced Patrol variant features Magpul MOE handguards, a Magpul K2 grip and an enhanced SOPMOD-style buttstock. 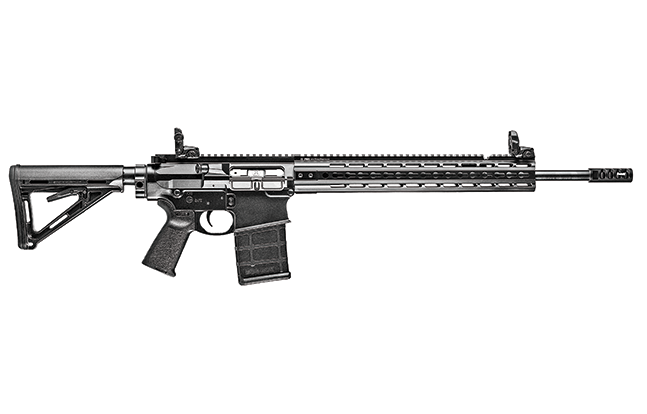 For a compact rifle in 5.56mm NATO or 6.8 SPC, it is tough to beat the Barrett REC7 Gen II, which is available with either a 9.25- or 16-inch barrel. The 5.56mm barrels have a 1-in-7-inch twist rate, while 6.8 SPC barrels have a 1-in-10-inch twist rate. The REC7 Gen II comes with a KeyMod handguard, a Magpul MOE stock and an oversized triggerguard. 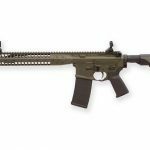 The rifle can be ordered with a black, grey, OD green or Flat Dark Earth Cerakote finish. For more information, visit barrett.net or call 615-896-2938. 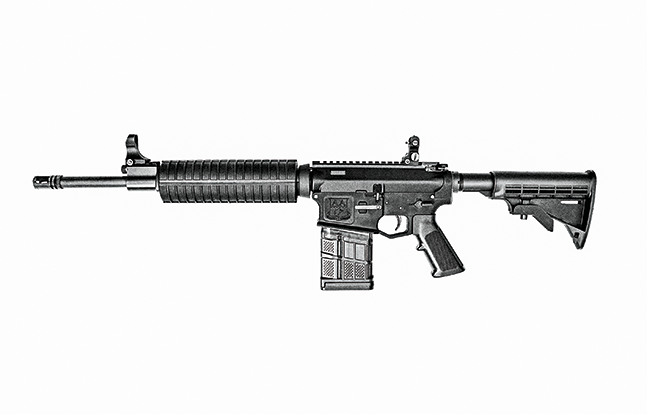 Long associated with the AR platform, it should be no surprise that Colt offers a piston-operated rifle. Called the LE6940P, the rifle is chambered in 5.56mm NATO and uses all standard AR-15 magazines. The LE6940P come with a 16.1-inch barrel, folding backup sights and an adjustable buttstock. 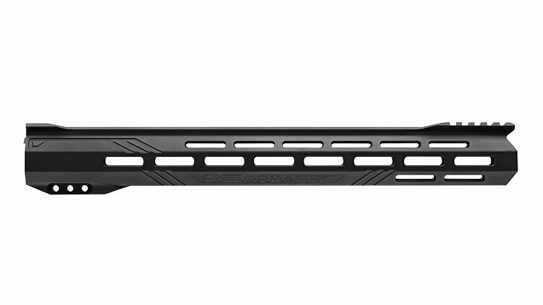 A quad-rail handguard also comes standard. 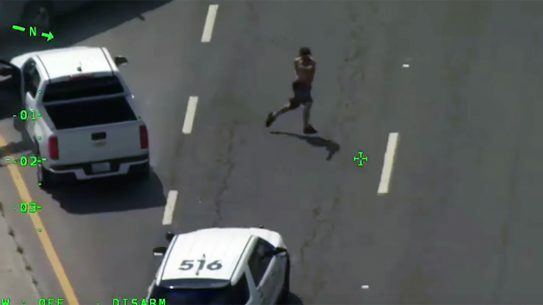 For more information, visit colt.com or call 800-962-2658. 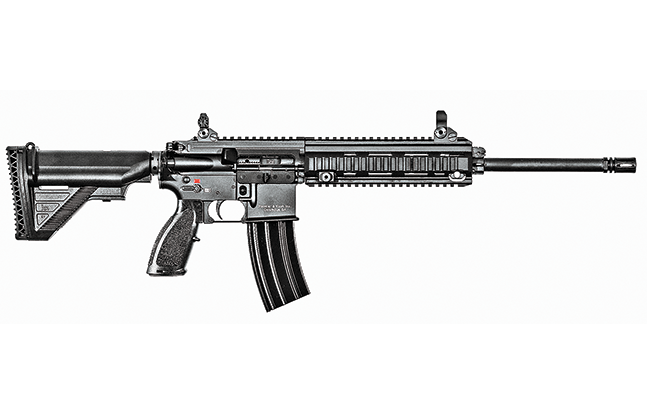 Using a piston operating system derived from the combat-proven HK416, the Heckler & Koch MR556A1 is one of the top options in piston rifles today. 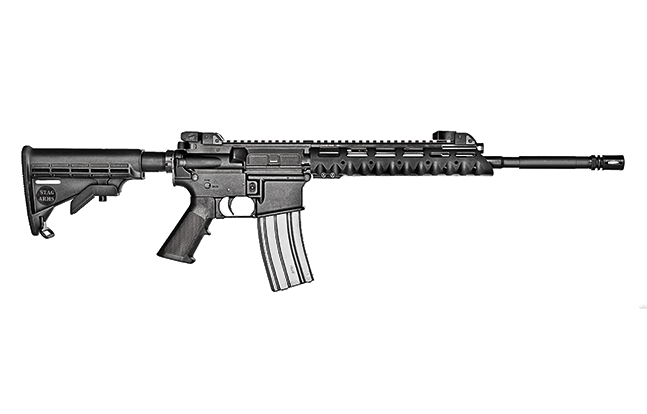 The MR556A1 uses a heavy-contour, 16.5-inch barrel with a 1-in-7-inch twist rate and a non-chromed bore for maximum accuracy. 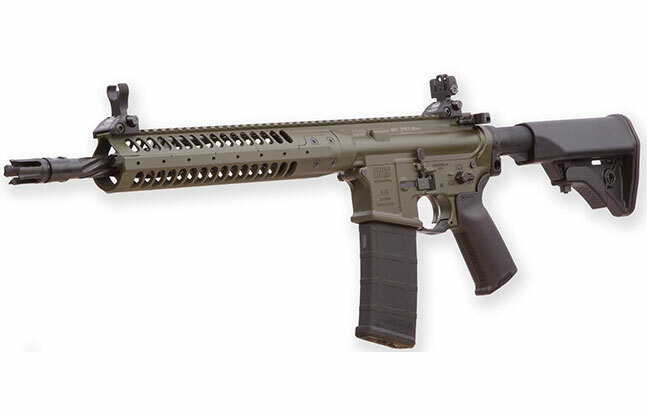 A free-floating quad-rail is standard on the MR556A1. Chambered in 7.62mm NATO, the Heckler & Koch MR762A1 is a reliable, compact rifle that offers better downrange performance than the typical 5.56mm. 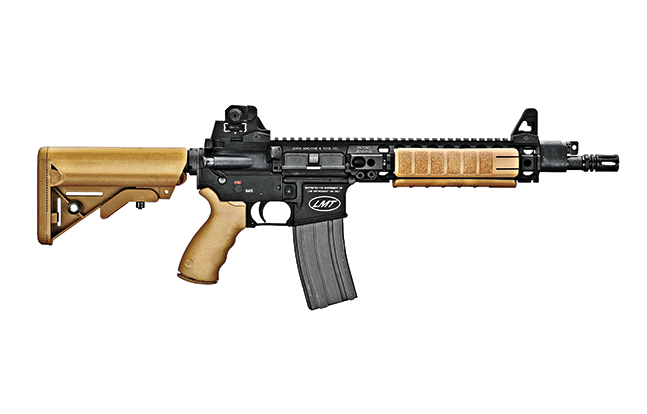 A 16.5-inch, cold-hammer-forged barrel is standard, as well as an adjustable buttstock, Troy flip-up front and rear sights and HK’s free-floating, quad-rail handguard. 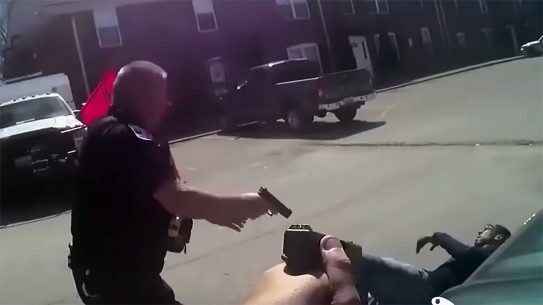 The rifle comes with a 20-round magazine. Aggressively priced at less than $950, the Mark IV carbine from Huldra Arms offers users an economical way to upgrade to a piston-operated carbine. These 5.56mm NATO rifles have 16-inch barrels with a 1-in-7-inch twist rate and a Melonite finish. The rifles come ready for mounting optics with a Picatinny rail and a low-profile gas block. 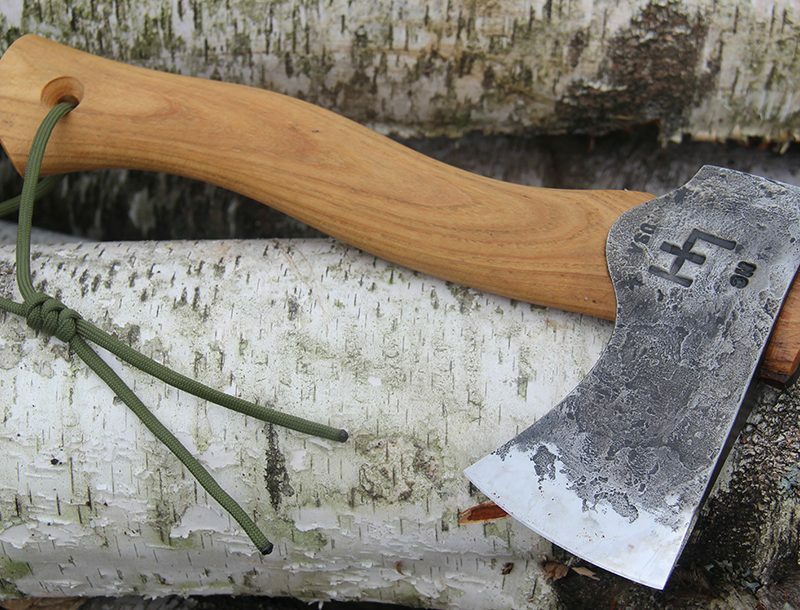 For more information, visit huldraarms.com or call 218-829-3521. Stepping up from the company’s entry-level carbine, the Huldra Mark IV Tactical EVO adds a number of features, including a Samson Evolution handguard and a Magpul CTR adjustable stock. 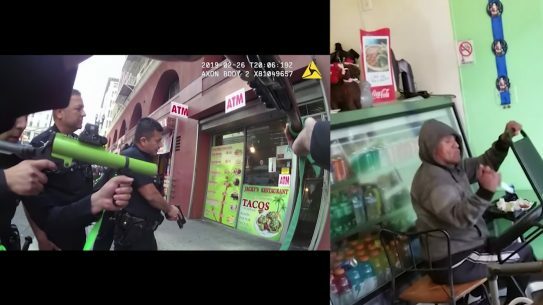 The rifle has a 14.5-inch barrel with a permanently attached flash suppressor. A Melonite finish is used on the barrel for enhanced corrosion resistance. 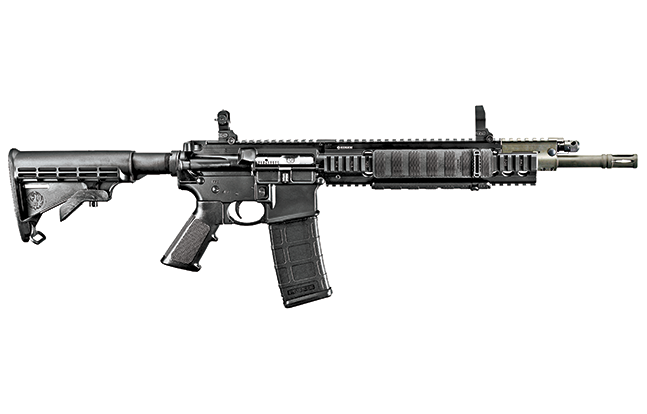 Designed for use in close quarters, the Lewis Machine & Tool Company (LMT) CQB MRP Defender Piston is a piston-driven AR available with either a 12- or 16-inch, chrome-lined barrel chambered in 5.56mm NATO. LMT cryogenically treats the barrel for longer life and improved accuracy. A quad-rail handguard and SOPMOD buttstock are standard features. The gun ships with tactical sights, rail covers and a sling with QD swivels. 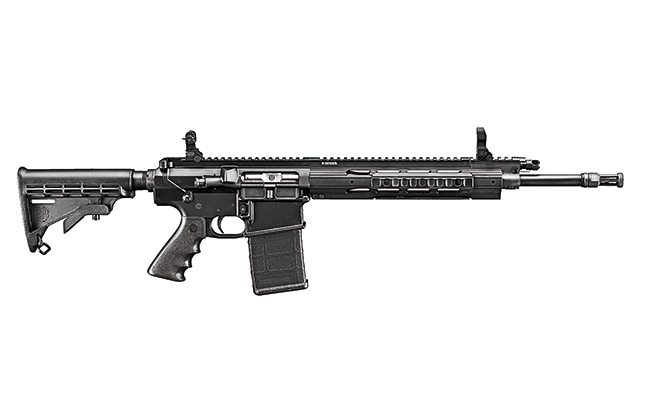 LMT also offers a 6.8 SPC-chambered gun with a 16-inch barrel. 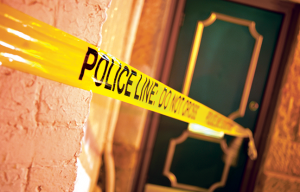 For more information, visit lmtdefense.com or call 309-787-7151. The Individual Carbine line is built on LWRCI’s patented self-regulating short-stroke gas-piston systems that are more reliable, capable and longer lasting. 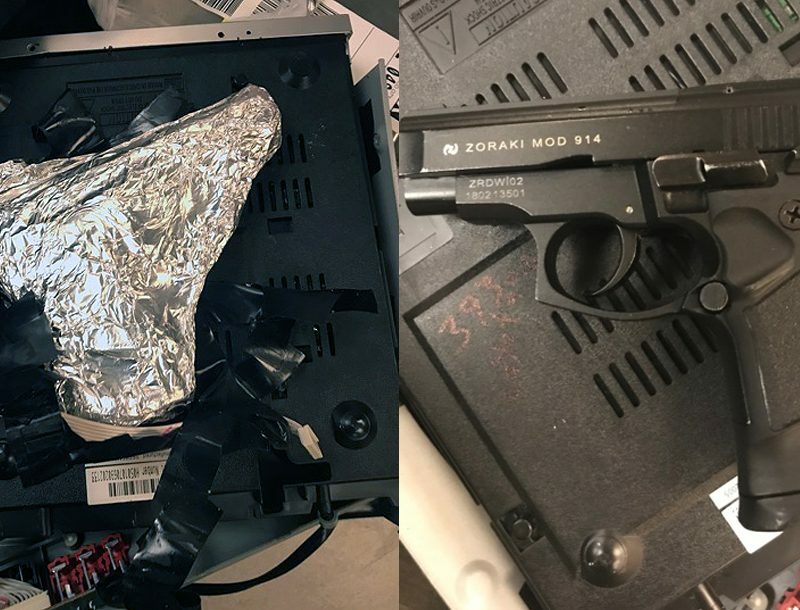 It includes revolutionary new features like a fully ambidextrous lower receiver, dual controls for bolt catch and release, a magazine release and fire control group. The lower receiver is compatible with all legacy AR 15 pattern upper receivers. The monoforge upper receiver is machined with an integrated rail base that is lighter and stronger. 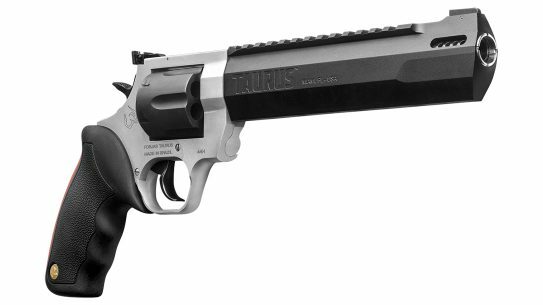 Other features include a two-position gas block with normal and suppressed settings, and a spiral fluted barrel that is 20 percent lighter. Increased surface area speeds cooling. 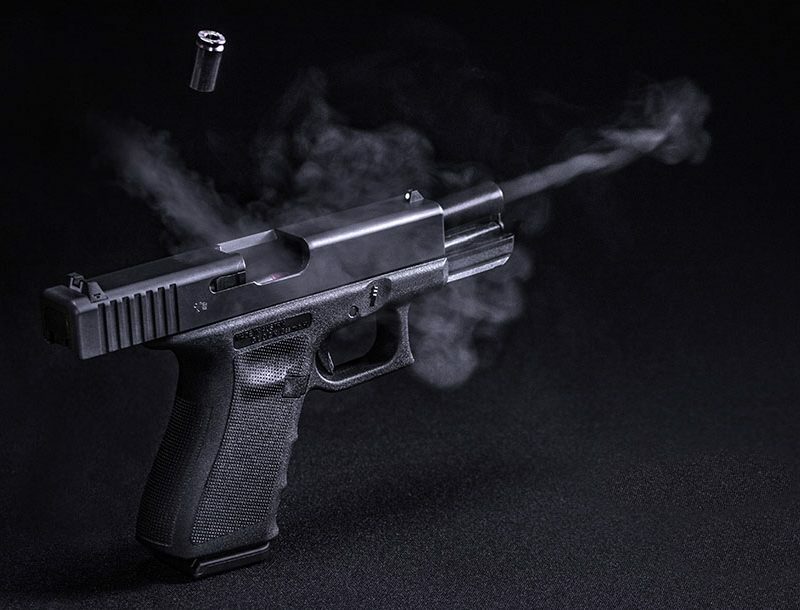 LWRCI Enhanced Fire Control Group is nickel-boron coated for a smooth crisp trigger pull with positive reset. Fore more information, visit LWRCI.com. 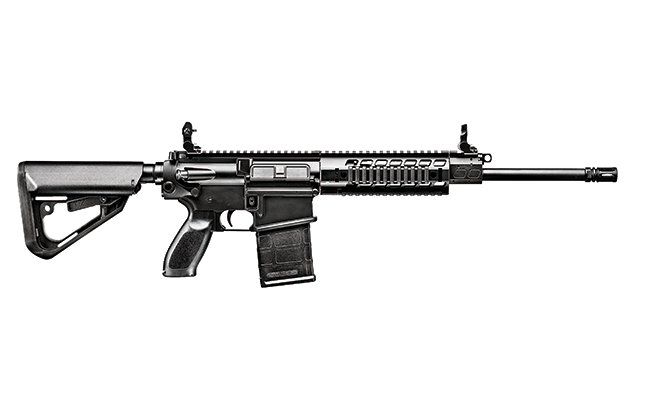 The Patriot Ordnance Factory (POF-USA) P308 is an AR-style rifle chambered for the 7.62mm NATO cartridge. Offering more long-range power than a typical 5.56 NATO gun, the P308 can be had with barrel lengths of 12.5 to 20 inches and be outfitted with a variety of precision optics. The rifles have ambidextrous controls and can be had in a variety of finishes, including Burnt Bronze and NP3. MSRPs start at $3,244.99. For more information, visit pof-usa.com or call 623-561-9572. 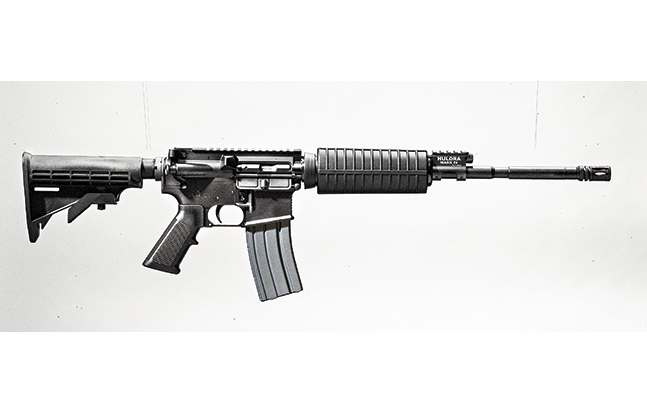 The P415 from Patriot Ordnance Factory (POF-USA) combines the fast-handling characteristics of a light and handy AR carbine with the rock-solid reliability of a piston operating system. These carbines are chambered in 5.56mm NATO and come with barrel lengths from 7.25 to 16.5 inches. Magpul stocks, pistol grips and magazines come standard. 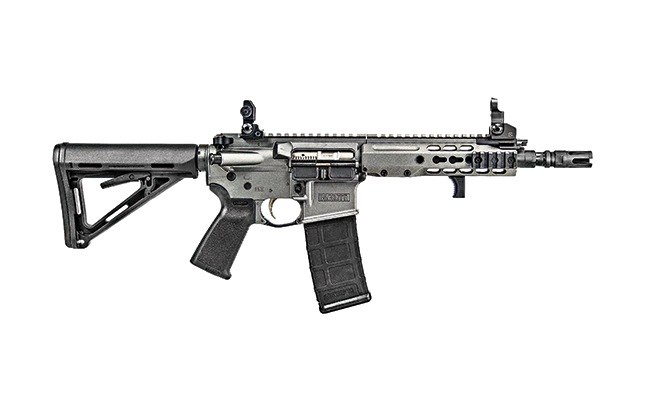 Light and compact, the MK109 from Primary Weapons Systems (PWS) gives users the increased punch of the 300 BLK cartridge from a 9.75-inch barrel. For those who want to employ a suppressor, this rifle can be extremely quiet. A KeyMod handguard is standard, as is the nickel-Teflon-coated bolt and carrier. 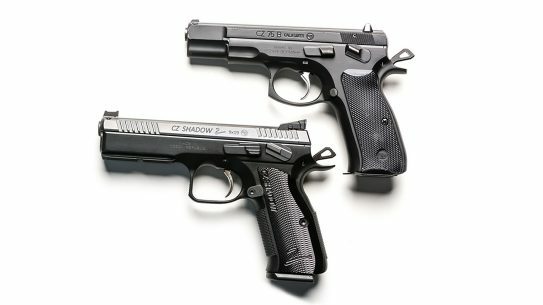 For more information, visit primaryweapons.com. 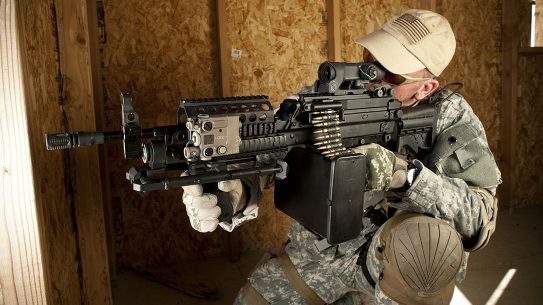 Designed as a designated marksman rifle, the PWS MK220 is chambered in 7.62mm NATO and has a 20-inch barrel. The button-rifled barrels are turned in-house by PWS, and they’re treated with Isonite QPQ for corrosion resistance. A PWS Precision Rifle Compensator reduces recoil while minimizing ground disturbance when shooting from prone. A Magpul MOE stock, pistol grip and 20-round magazine are standard. Like the MK109, the MK220 uses a KeyMod rail for mounting accessories. The Rock River Arms LAR-PDS is a 5.56mm NATO carbine with a folding stock and a non-reciprocating, side-mounted charging handle. 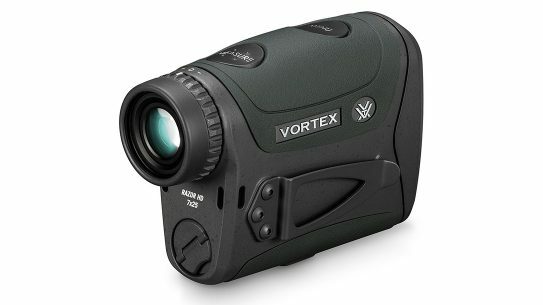 The upper has a single, full-length Picatinny rail allowing users to mount optics. The buttstock can fold to the side, providing a compact package. 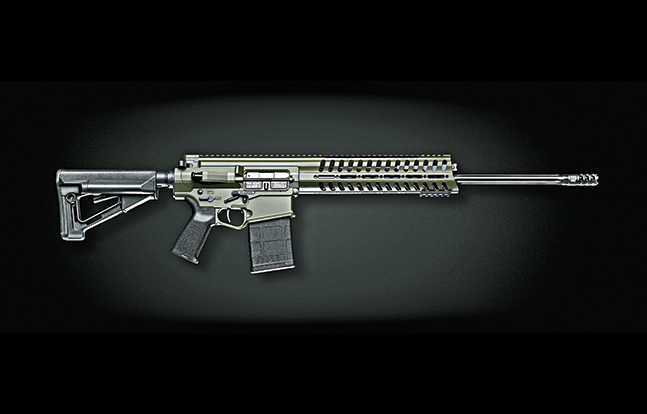 An injection-molded, ribbed handguard and an aluminum tri-rail handguard are both available for this rifle. 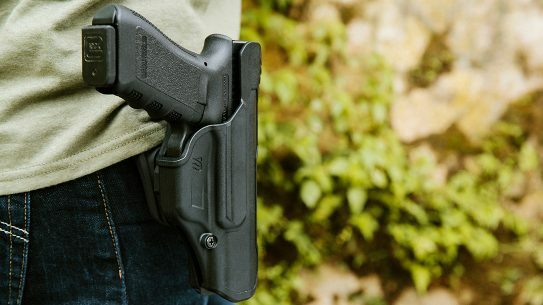 For more information, visit rockriverarms.com or call 866-980-7625. 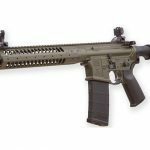 Ready for duty out of the box, the Ruger SR-556 Carbine is an AR-style rifle chambered for the ubiquitous 5.56mm NATO cartridge. The four-position gas regulator allows the gun to be tuned to your specific ammunition for outstanding reliability. 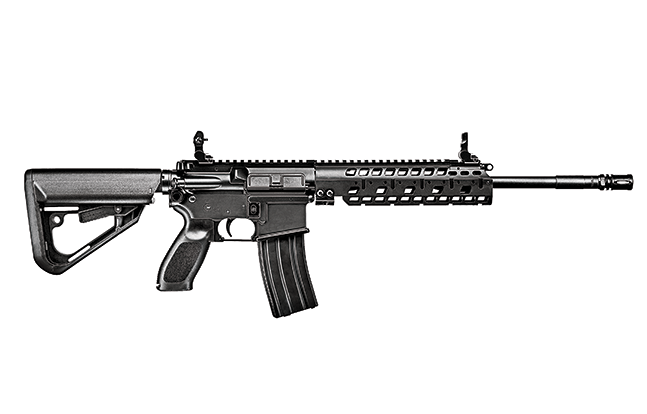 The rifles come with folding sights, an adjustable buttstock and a quad-rail handguard. 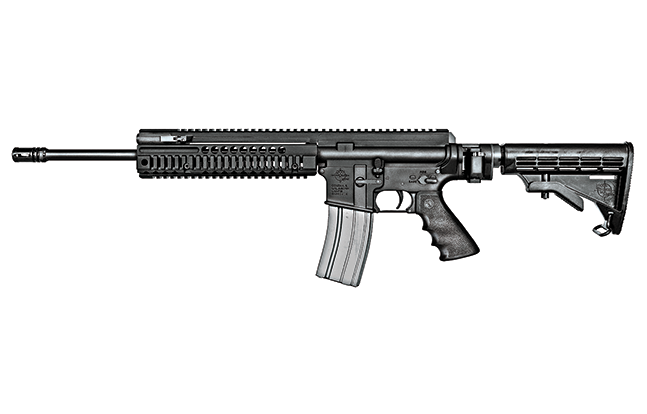 Similar in operation and appearance to the company’s SR-556 rifle, the Ruger SR-762 upsizes the caliber to 7.62mm NATO. 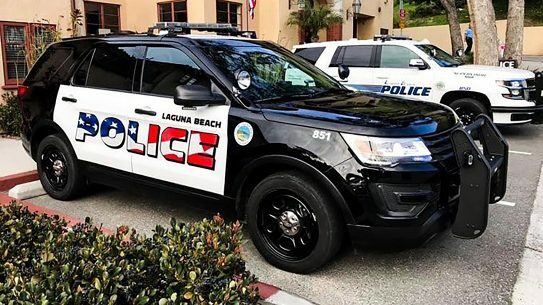 The chrome-lined, cold-hammer-forged barrel is 16.12 inches long, fluted and topped with a Mini-14-style flash suppressor. 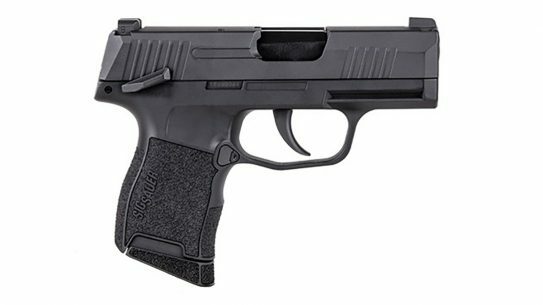 A Hogue Monogrip pistol grip is standard, as is the adjustable buttstock and the lightweight handguard. 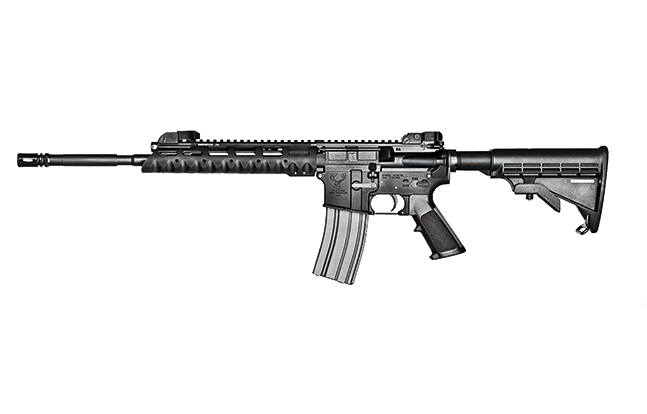 The SIG516 from Sig Sauer uses a short-stroke piston system with a four-position adjustable gas valve to provide officers with optimum reliability. Chambered in 5.56mm NATO, the SIG516 uses standard AR-15/M4 magazines but adds an ambidextrous mag release for left-handed shooters. Flip-up sights, an adjustable buttstock and a quad-rail handguard are all standard. If you need the heavier hitting power of a 7.62mm NATO-chambered rifle, the piston-driven Sig Sauer SIG716 deserves a look. With a six-position buttstock and an ambidextrous magazine release, these guns are well suited for a wide variety of users. QD-type sling attachments and iron backup sights are standard. The nitride-treated barrel is 16 inches long and has a 1-in-10-inch twist rate. As one of the most reasonably priced piston ARs on the market, the Stag Arms Model 8T has a surprising amount of standard features and customizable options. Chambered in 5.56mm NATO or 6.8 SPC, the 16-inch, chrome-lined barrel is button rifled and has a 1-in-9-inch twist rate. 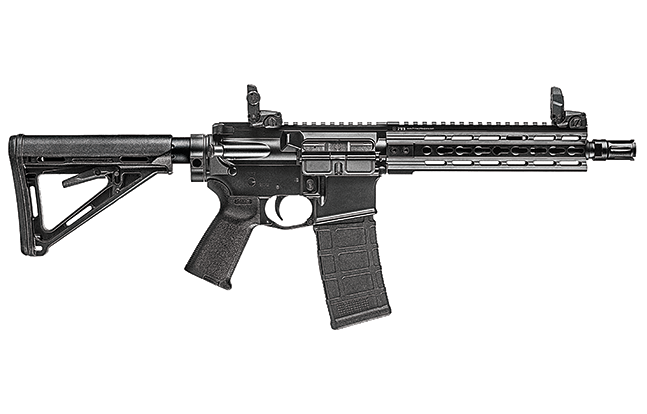 The rifle comes standard with a free-floating Diamondhead VRS-T handguard and Diamondhead front and rear sights. 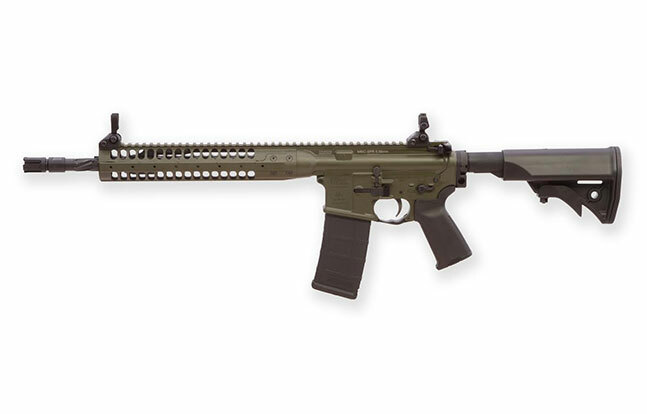 Stag Arms is one of the few companies that make left-handed AR-style rifles. The Model 8TL is a left-handed version of the popular 8T, and it comes with all of the same features, including the chrome-lined barrel, Diamondhead components and an adjustable buttstock. Standard rifles are chambered in 5.56mm NATO, but the guns can also be had in 6.8 SPC.